Naoko Kikuchi in Studio NEIRO. The traditional Japanese instrument, the koto, can be rented in our studio NEIRO in Vršovice. 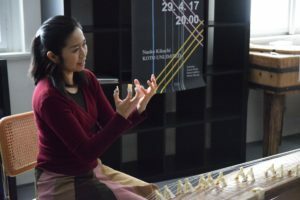 Absolute beginners have the opportunity to receive an opening lecture from the violin and koto player Anna Romanovská Fliegrová, a student of Naoko Kikuchi, a professional koto player living in Frankfurt. NEIRO also organises workshops led by foreign guests, such as Naoko Kikuchi. All of our instruments are maintained by a Japanese professional.